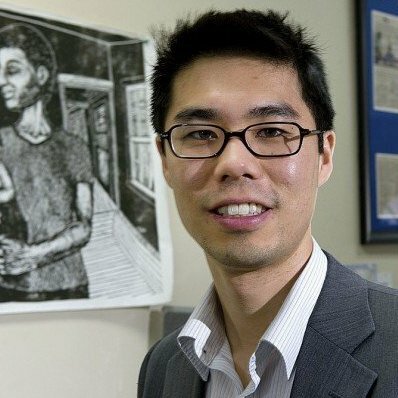 Aaron Tanaka is Co-Founder of the Center for Economic Democracy and Senior Advisor of the Boston Impact Initiative. Aaron comes to this work as a community organizer and economic development professional based in Boston’s Roxbury neighborhood. Aaron was the first Managing Director of the Boston Impact Initiative and was the founding executive director of the Boston Workers Alliance, where Aaron helped build a nationally recognized non-profit that combined grassroots policy advocacy with cooperative business development in Boston’s low-income communities of color. Aaron is also a co-chair of the Asian American Resource Workshop and the New Economy Coalition and is a Fellow with the Business Alliance for Local Living Economies (BALLE). Could you talk about your background and how it led to your interest in working for social and economic justice? Becoming an activist can definitely be traced back to my family and teenage experiences. I grew up in the East San Francisco Bay, in El Cerrito, California. My father was a professor of Buddhist studies, my mother was a piano teacher and musical educator. They both emphasized how grateful they were to find work that was meaningful for them, to do something that they love. I was encouraged to find passion in my pursuits. I was also really well taken care of and supported by my family. My grandma lived with us, and I enjoyed a stable childhood with my younger brother and sister on a quiet middle class block. We we definitely weren’t wealthy- both of my parents were first to college in their families and when I was born, my parents depended on WIC to supplement their income. But I never feared hunger, and took for granted a very full and enriched childhood. I went to school in the Richmond Unified School District, now called West Contra Costa County District. The district went bankrupt while I was in elementary school and suffered from a lot of divestment and mismanagement. Starting in middle school, most of my classmates were from working class and low-income families, and a vast majority of us were people of color. As a 12 year-old, I was used to walking through metal detectors to enter my school building. I began to see the way my classmates who were smart and curious people were being tracked into “remedial” classes. I knew that we were responsible for our choices, but saw the available paths as a product of our environment and the luck of the draw. That worldview stayed with me as I moved through high school and saw the ways my own family privilege and the resources I had were not the same as my classmates. By my senior year, I was choosing between multiple colleges while I knew that some of my classmates would not graduate or were already getting caught up in the criminal justice system. It laid a foundation for my interest in ending the prison system and creating schools and an economy where people can achieve their truest potential. Could you describe how you became interested in community organizing? Leaving the Bay Area to go to Harvard for college, I was the only student in my school district to go that year. Motivated by my earlier concerns, I started my freshman year tutoring at a juvenile detention center. Spending time with a good guy, not much younger than myself only confirmed my sense that the prison system was really broken. My initial interest was to reform the system by getting involved in electoral politics. But early in my first year, in my first election as a voter, George W. Bush beat Al Gore in a campaign where I was supporting Nader (in Massachusetts). I felt so disconnected from and disenchanted by the realities of electoral politics. At the end of my first year, 40 students took over the Harvard President’s office for a 3-week sit-in and campus wide campaign to demand a living wage for all campus workers. It gained international media attention, and I saw how direct action organizing could pressure leaders and politicians to do the right thing. My sophomore year, I started interning with the American Friends Service Committee. There the first campaign I worked on was an effort to shut down long-term solitary confinement in Massachusetts prisons. Learning from former prisoners and staff organizers who led the campaign, I came to see the pervasive practice of long-term solitary confinement as an unrecognized humanitarian catastrophe and moral abomination. I also saw more clearly the way the broader system targeted and dehumanized low-income people and people of color. Through the work, I saw the courage and effectiveness of former prisoners and their families as they organized to tell stories, and build awareness and action in the community. So when I graduated, I was fortunate enough to receive a public service fellowship that allowed me to stay in Boston as community organizer and co-found the Boston Workers Alliance and act as its first staff. What is the Boston Workers’ Alliance? Could you discuss the history of its formation and where its work lies today? The Boston Workers’ Alliance was formed as a grassroots union of under and unemployed workers, particularly people of color, particularly people who had barriers to employment. The unemployment rate in Roxbury has been as high as 40 percent among young men of color and we saw the need to approach joblessness as a political and economic crisis, a structural problem, rather than seeing joblessness as a personal deficiency. There are great social service agencies in the community that help people build their capacity to get jobs but we knew that the crisis of urban unemployment was a symptom of the economic system, intertwined with the dominant racism that pervades our society. Harvard is a pretty different place than Roxbury. How did you have to shift the way you were organizing when you moved from campus organizing to community organizing? When I started working at the American Friends Service Committee, that was really when I started to interrogate my role in social movement work. One of my pivotal mentors at AFSC was Jamie Bissonette. As Harvard students, we are told that we are the leaders of the future, but Jamie helped me see that meaningful social leadership requires the ability to take leadership from people who are experiencing the injustices. The basic idea that people who are most impacted by a problem must be at the center of any movement for their solutions. That belief informed approach as a community organizing and was reflected in how we tried to build the BWA. In practical terms, that meant that Boston Workers’ Alliance was a member-based organization and board members were elected. The majority of the staff we hired was also out of our membership base through our leadership-training pipeline. Because there was a real sense of ownership of the community, we benefitted from a broad base of support and was able to identify and respond to the needs most felt by our members. Could you talk about the Boston Workers’ Alliance’s history and talk about some of its accomplishments? We started the Boston Workers’ Alliance in the summer of 2005. The first campaign our members decided to engage with was reforming the criminal record laws, called the Criminal Offender Record Information (CORI) in Massachusetts. Many of our members who were qualified to work were being denied countless jobs because of their race, and explicitly because of a CORI. In our first year, that really meant bringing in lawyers to train members in the laws and regulations that uphold the CORI system. It also meant helping our members break beyond some self-blame from not being able to get a job because of a past mistake, and find power by connecting with other people who were experiencing similar injustices. In 2007, after dozens of community meetings and handing out tens of thousands of flyers about CORI reform, we led our first major mobilization. Over 2,500 people marched form Roxbury down to the state house, demanding CORI Reform. Specifically, we helped popularize a demand to “ban the box” for all businesses and started to get attention from the Governor and State House. After a 5-year statewide campaign that involved 140 organizations, lobby days, direct action, media and cultural organizing, we helped pass comprehensive legislation that ex-prisoners and those with CORI had helped draft several years prior. Did your organization help start the national “ban the box” movement? Before we started doing state work, Boston activists led by Councilor Chuck Turner and some of our partners passed “ban the box” at a municipal level at Boston. It was the first Public Hearing that BWA members mobilized for, and the first time many of us had been to City Hall. That might have been the first in the country to apply Ban the Box not only to City jobs, but also to businesses that had contracts with the City of Boston. It then passed in Cambridge and Worcester, which served as a strategic foundation to push the policy statewide. Did the Boston Workers’ Alliance support co-op development too? We knew that even if we were able to remove criminal record barriers to employment, it didn’t address the simple lack of jobs, period. So we decided to take the question of job creation into our own hands. If ex-prisoners could form their own businesses, they would also be inclusive community employers. We were influenced by learning from Mondragón and also early on hosted learning exchanges with the recuperated factories movement (movimiento de trababajadores desocupados) leaders from Argentina, who helped seed the idea of building worker-owned, democratically run businesses as movement work. Our first cooperative businesses involved training people to do urban gardening. Our other co-op that was formed was a business called Roxbury Green Power, which was a local recycling company focusing on veggie oil. This business would later be rebooted as CERO (Cooperative Energy Recycling and Organics), which is a green, worker owned cooperative composting business. CERO has since gained national attention as an inspirational movement-oriented startup. As an organization, we were always interested in building political power and fighting for policy change, while engaging in economic development strategies that model the future that we hope to live in. In this vein, one other piece of work at Boston Workers’ Alliance has been leading the participatory budgeting campaign in Boston. The Mayor eventually created a participatory budgeting process for youth, where they can vote on the use of $1 million a year. This project, called Youth Lead the Change, is now in its third cycle. Describe the Boston Impact Initiative. What brought you there? How did it form? What is its role today? After I left the Boston Workers’ Alliance, I was excited about the work we started to build worker cooperatives, and was also clear that these inspirational models struggled to find access to traditional capital. So I was fortunate to meet Deborah Frieze, an author, former entrepreneur, and national Local Economy thought leader, who had recently launched a new impact investment fund, the Boston Impact Initiative. She seeded the fund with her father Michael Frieze, a very successful CEO in finance with a lifetime of generous philanthropy. As partners, it’s cool to see how their different skills are complimentary and allow for this pretty unique and intrepid fund to exist. I was fortunate to be hired as their start-up manager and then became the first managing director. When did the Boston Impact Initiative begin? What has it accomplished? What challenges does it face? It began in 2013. Believing in the need for more flexible capital, we started with the ability to make loans, equity investments, and grants. Our focus has been to bring capital to communities that have been historically excluded from access, specifically focusing on entrepreneurs from Boston’s low-income communities of color. Boston Impact Initiative was our area’s first private, placed-based impact fund and has helped model nimble and high impact investment strategies. This feels important as more foundations and endowments look to shift capital towards local investing. We see our role as finance activists, seeking to transform the local capital ecosystem by modeling new approaches, and working as a local conveners and network builders. What are some of the businesses the Boston Impact Initiative has funded? One of the first businesses that we invested in was CERO, which was a cooperative business I helped seed while at Boston Workers’ Alliance. We consider CERO a kind of model investment. We gave them their first loan in partnership with the Cooperative Fund of New England, which they then parlayed into launching a direct public offering (DPO), from which they raised $340,000 from small community investors. Boston Impact Initiative was one of the first DPO shareholders. We are currently hoping to help structure a second loan, to help them scale their business and purchase more trucks. CERO’s worker-owners are working class people and likely would not be able to secure conventional financing from a bank. But because of the potentially transformative nature of the business, Boston Impact Initiative took an initial risk that has since paid off with the great success for this business. At this point, they have seven employees and are composting over 6 tons of food waste a week. Are there other businesses that you have invested in? To date, we’ve made over 25 investments including two microfinance funds that support smaller businesses, and a new worker and consumer owned grocery store in Dorchester that is in development. We’ve also financed a shared culinary incubator in Dorchester that houses dozens of minority and women owned food businesses. We’re also exploring the use of private equity investments to facilitate business conversions to worker co-ops by selling our equity to employees as an exit strategy over time. How Is the Fund doing? The Fund is doing great in that we see a lot of impact from our investments and we haven’t had any defaults. As we’ve gained some success and experience, we plan to open up our fund to other aligned investors in the next years. Could you talk about the experience of participatory budgeting in Boston? While I was in transition between my work at Boston Workers’ Alliance and the Boston Impact Initiative, I was contracted with the Participatory Budgeting Project to be their lead organizer in supporting the city in launching its participatory budgeting process. I had a pretty intimate look at the rollout of the initiative. How this youth participatory budgeting experiment working? The first year was a very eye-opening and exciting year of learning. There were over 1,200 young people who voted in the process and youth ages 12 to 25 were involved in brainstorming and developing concrete proposals that got voted on. From a personal perspective, watching the young folks deliberate in the lunch room about which projects to fund was inspiring and affirming around the capacity of people to make good decisions that affect their community. So, for example, I watched young people debate between supporting one big project that would take up the majority of the fund versus smaller projects that would benefit a larger number of neighborhoods. Are there projects that likely would not have gotten funded outside of participatory budgeting that are getting funding? One example is a feasibility study for a skate park. Young people found the need for safe and appropriate places to hang out and skateboard. How do participants in participatory budgeting process interact with city staff? The City’s Department of Youth Engagement and Employment staff and oversee the project. A different set of staff in the Budget Office work with youth to turn their ideas into actual budget proposals. That process of young people working with city budget staff is a core part of the planning process. A lot of young people express their enjoyment in getting to be involved in the inner workings of budget planning. The overall project is now also connected to the Mayor’s Youth Council. Has Boston spawned any imitators? There are a lot of participatory budgeting processes that are increasingly inclusive of youth but not I’m not sure if there are other citywide, youth only processes. Boston is said to have a progressive government. What difference has the new administration made? Where does it still need to be pushed? The new administration has articulated many of the values that our economic justice organizations have been calling for. We have strong progressives like John Barros, former Dudley Street Neighbors Inc. (DSNI) director, in the economic development chair. The administration, for example, has supported full-heartedly the participatory budgeting process. And at the same time a lot of the same dynamics that afflict high investment cities like New York and San Francisco persist here. Boston is one of the wealthiest, one of the fastest gentrifying, and one of the most economically unequal cities in the country. The rate of displacement of low-income people of color is at crisis levels and will need much more ambitious strategy and leadership from the administration to truly address the economic dynamics. Boston regularly rates in the top five cities nationally in terms of the extent of gentrification. Could you talk about your work in the New Economy Coalition? I joined NEC in the first class of elected board members in 2014 and then became co-chair, along with Leah Hunt Hendricks. A big question for me when I was leaving Boston Workers’ Alliance, and persisted with me at Boston Impact Initiative, related to what our long-term national strategy for building a new economy would be. It was very clear to me that our economic system of capitalism intertwined with our system of racism and sexism perpetuate injustices that our organizations were fighting against. And yet as a progressive left we had been unable to overcome the belief that there is no alternative. And we’ve also been unable to say that the transformation of capitalism is a core goal of our movement. At the same time, we saw some Pew polls that showed that young people were increasingly favoring the idea of socialism over capitalism. And then we saw the global spread of the occupy movement that would indict the economic system and concentration of wealth. And we see the popularity of books like Piketty’s Capital and Naomi Klein’s new book, that speak explicitly to the troubling dynamics of the capitalist economy. So I was privileged to join the NEC leadership, which was making an effort to name a new brewing movement that is more squarely aimed at transforming the economic system itself. The coalition includes over 135 organizations from around the country. NEC acts a field-building network that helps convene, connect, and resource the burgeoning field. How does your work locally connect with broader national movements? In general, I believe there is tremendous amount of work we can do at the local level and at the same time we need to look at this work in generational terms and at the national level if we are really reaching for true transformation. I see the “new economy” field as a still undefined and growing movement sector in the United States, so right now the importance of driving local work and models and then connecting them to local organizing and integrating them into a national narrative are all essential. Describe your work with the Center for Economic Democracy. What is it? What stage in its development are you at? How does it build on your earlier work? The Center for Economic Democracy is a still new organization. We see it as a movement, capacity building, and infrastructure organization. We see our core constituencies as grassroots movement building organizations and the small business and cooperative sector. Our work is really focused at the intersection of political power building, cooperative economic development, and cultural organizing. So when I was at the Boston Workers Alliance, we were fighting for job access and also began experimenting with modeling worker co-ops. Local housing justice groups life City Life/Vida Urbana fought anti-eviction campaigns for decades but are now also investing in the creation of Community Land Trusts. The opportunity for low-income communities and communities of color to begin building the future we want to live in is present and real. CED hopes to better integrate grassroots organizing efforts in the streets, with efforts to build and scale economic models and practices that help us lean into real alternatives to capitalism. Understanding that the Center is new, could you talk about its scale and the roles that you envision it will play? We’re hoping to start full operations next year. Over the last three years, we’ve been testing programs, building out our theory of change, and forming new relationships and engaging diverse stakeholders. Past programs have included supporting the participatory budgeting process and helping promote the direct public offering that the CERO co-op used to raise $340,000. The Center has also been involved in supporting the community land trust network with research and policy support and has included intensive popular political and economic education for grassroots organizers and community leaders. We have two primary programs, as we move into the next year. One is called Solidarity Economy Initiative, which is a collaborative of local funders to support grassroots organizations in engaging with new economy models and strategies. We’re resourcing a multiyear learning and planning process to engage community members and activists to better understand and engage in new economy strategies. It’s a field building strategy that hopes to transform the breadth and orientation of our local organizing sector. Our other primary project is a program is called the Ujima Project, where we’re convening a network of grassroots leaders, business owners, funders, and investors who are working to build a democratically governed investment fund, community business certification, and local currency to model non-capitalist modes of value creation, circulation, and consumption. Ujima is a Swahili word and one of the Kwanza principles for collective work and responsibility. So our work at the Center for Economic Democracy is both to help define and better articulate a holistic alternative to capitalism and state socialism, which we call economic democracy. We also train and resource our communities to build new types of power, and move towards that long-term vision through place based, immediately impactful model projects. So we are interested in building short-term alternatives that can lead to long-term transformation. How is the Center for Economic Democracy supported? Foundations? Members? The Center for Economic Democracy will be supported by a mix of sources, including progressive foundations, social investors, businesses, and aligned individuals. We’ve been around the country talking to a lot of people, and I’ve been really encouraged by the interest and increasing strategic convergence. People are embracing our efforts to ground “new economy” work within a grassroots movement building context. We’ll also do some project based consulting to support economic democracy work outside of our local programs. In addition to your economic democracy work, you have also focused a significant part of your work on racial equity, including conducting trainings. Could you talk about your work on racial equity and how it intersects with your economic development work? I became politicized through activism around the prison-industrial complex. It was there where I became radicalized, as I started to imagine what a world without prisons would look like. So I understood from an early phase that race, gender, sexuality, and economy were necessarily intertwined in this country and that it was impossible to differentiate issues of racial equity and economic justice. In practical terms, that has meant that I have developed my skills as an anti-oppression trainer and facilitator. It’s included training privileged white people to become anti-racist activists within white communities. It has also met grappling within Asian American and other non-black communities of color about the anti-black bias that exists in our community. It has meant trying to center the perspectives and voices of people of color, particularly women, low-income people, and queer and transgender people to be at the center of our movement work. And it has meant being out in the streets helping shut down the highway when the young people of Boston rebelled, along with the rest of the country, demanding that Black Lives Matter. You’ve talked about the importance of creating a supportive ecosystem to support community wealth building. For you, what are the key elements of this work? The Solidarity Economy Initiative is trying to embed education and training within grassroots organizations to start popularizing and demanding policies that scale new worker cooperatives, Community Land Trusts, Jobs Not Jails legislation, and other transformative economy efforts. Through the Ujima Project, we are trying to set up an investment fund that communities control to move capital to new co-ops and land trusts. Ujima Project is also trying to create a Good Business Certification to ensure that the projects we finance and support reflect the social and economic justice values we advocate for in the broader economy. And we’re learning from the Cleveland Model to focus anchor institution purchasing to support our network of certified Good Businesses. Finally, we’re exploring the creation of alternative currency to incentive local purchasing by community residents and retain wealth within our community economy. We’re trying to model and grow the workings of an alternative democratic economy. Do you find that people when they join worker co-ops need skill training in either basic skills or cooperative governance? If so, how have you dealt with workforce development challenges? Boston is very lucky to have a large network of technical assistance providers that are supposed to be supporting business development among entrepreneurs of color. So there’s an ecosystem opportunity to engage the mainstream technical assistance providers to start incorporating worker cooperative models into their own training. Rather than having to build co-op worker trainings from scratch, we can train the existing business coaches to start teaching and promoting cooperatives. We are fortunate to have some very talented co-op developers like Stacey Cordeiro from BCCO and the ICA Group, who are capable of training future developers to support and educate a new generation of cooperators. Have you enlisted local government support for cooperative development? Could you talk about the role of public policy in helping build the ecosystem of support for co-ops? I wouldn’t say that local government is fully educated or aligned around co-ops. But we’ve seen instances of increasing awareness and support. For example, one of CERO Co-op's worker-owners Tim Hall received the Mayor’s “Green-ovate Award.” We have also seen that the Massachusetts Growth Capital Corporation, which is a public-private partnership, has started to give some technical assistance grants to co-op developers. Actually, my own activist worker-owned catering co-op called Olio Culinary is receiving support from MGCC and Co-op Fund of New England with free technical assistance for our development. However, the city of Boston has yet to reach a level like New York or Madison, both which have specifically legislated resources to support cooperatives. We are still exploring the strategies and regulatory changes that would be needed to push government procurement and purchasing to favor co-ops and employee-owned businesses. What do you see as the potential for worker cooperatives in Boston going forward? Hopefully, a growing student divestment movement is able to move Boston area university endowments out of investments in prisons, war, and fossil fuels, and into local capital funds that finance co-ops. Hospitals and government will be spending their purchasing dollars on local co-ops and good community businesses. As we invest more energy at the intersection of political power building and cooperative economics, we hope that grassroots and labor groups fight for good standards against the extractive corporations, like the Fight for $15, but also fuel an emerging worker ownership sector that offers an alternative to the wage-labor model all together. And as the cooperative economy grows, it’s also able to finance our political movements and help grow political and cultural power. The sectors become more integrated and symbiotic. If you were to highlight a few key accomplishments of your work to date, what would they be? It was an honor to be part of the 5-year CORI reform campaign while I was at the Boston Workers’ Alliance. We’re the second state in the country to ban the box for all private businesses. And that legislation also allowed hundreds of thousand people to newly seal their old criminal records. So this has meant that literally hundreds of thousands of Massachusetts residents who carry the emotional stress of having a scarlet letter were freed overnight from that disadvantage because of the hard work of the thousands of people who helped pass that policy. We popularized our campaign within a framework of needing “Jobs, Not Jails” and talked about being “smart on crime” instead of “tough on crime.” I think the mass popular education we did between 2005 and 2010 contributed to a local and national consciousness that we are still being reflected today. A couple of other very fulfilling projects that I have been involved include helping bring participatory budgeting to Boston, and supporting the formation of some amazing co-ops as an organizer and investor. For more information on the Boston Impact Initiative, see: http://bostonimpact.com.